Not all girls love romantic proposal! Most girls love romance. Most boys know about it. So many boys choose to propose to their girls in a very romantic way. However, there are some girls who don’t love romance. 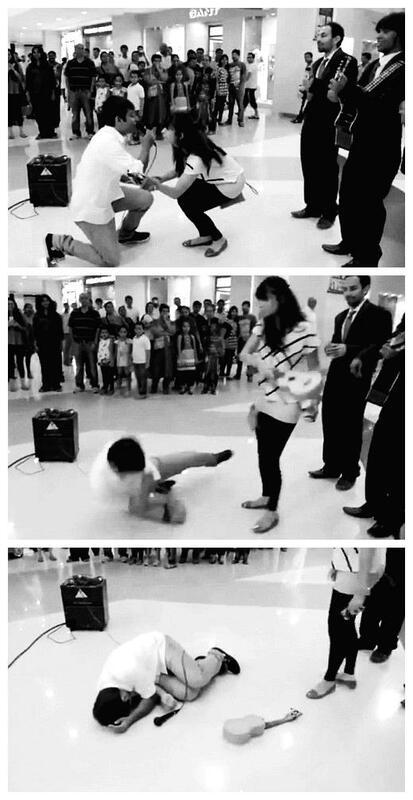 An Indian proposes to his girlfriend inside a shopping mall in the witness of all people who go shopping here. But his girlfriend doesn’t say “Yes”. Instead, she hits his head with the guitar and then walks away. What happened is recorded by the camera and uploaded to Youtube. It wins more than 2 million hits. I don’t know how long this guy prepares for the proposal. He walks with his girlfriend hand in hand in the shopping mall. Suddenly, a band appears and plays music for them. Then he takes out a microphone and says “I am going to confess my love to a special girl. This is where we met three months ago…” After his confession, he started to recite poems. The girl isn’t as surprised and excited as other girls. When the boy kneels down and proposes to her, she says “No, no, no” and tries to raise him up. The boy doesn’t want to stand up. All of a sudden, the girl seizes the guitar from the musician, hits her boyfriend’s head, and throws away the guitar and then walks away, leaving the boy lying on the ground. Either she's not ready to be engaged or she wants the boy to propose to her according to their traditional way where both parents need to discuss and accept. Why do I feel that it's just a show? Even the girl doesn't accept his proposal, she shouldn't beat him with the guitar. Perhaps, she learns this from My Sassy Girlfriend, a South Korean movie. Could be too as the others didn't offer to stop or offer their hands to help the victim. The audience were surprised when they saw this. It took long for the audience to react. When they become normal, the girl just left. The boy probably watches too much Bollywood movies. What are Bollywood movies? Wan, I actually watched some Indian movies. Indian songs and dances are shown almost in every movie. The actors and actresses speak English but Indian songs and dances appear when the music is on. I am frustrated because I don't know what the songs and dances are. Just feel that the rhythms are nice. I responded to this question in other post. He deserves that. The girl says "No", it means that she doesn't accept his proposal. Why does he force her to accept his proposal? I don't think he deserves to be bashed with a guitar. The girl used the guitar to vent her anger. She just told him "This is what you deserve after forcing me to do something I won't do." Post a Reply to: Not all girls love romantic proposal!